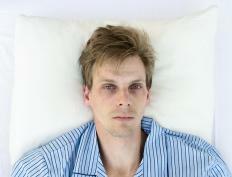 Chloral hydrate may be used to treat insomnia. Chloral hydrate is a sedative drug commonly prescribed for people with insomnia. It may also be given before a surgical procedure to dull pain and help the patient relax. It works by depressing the central nervous system (CNS), thereby calming brain and nerve activity. Chloral hydrate can cause unwanted side effects and possibly induce major heart, brain, and lung complications, so it is important to use the drug exactly how it is prescribed. There are also risks of addiction when taking chloral hydrate regularly for more than two weeks at a time. Doctors are uncertain exactly how chloral hydrate affects the CNS, but research suggests that it increases the supply of a neurotransmitter called gamma-aminobutyric acid (GABA) in the brain. GABA controls the excitability levels of neurons, helping to keep the brain calm and slowing down nerve signaling throughout the body. As a result, muscles are able to relax and the heart rate slightly drops. People who suffer from acute bouts of insomnia become less anxious and physically restless at night when taking the drug. Most adult patients with insomnia are instructed to take single 500-milligram to 1-gram doses of chloral hydrate about half an hour before bedtime. For preoperative sedation, smaller dosages are usually administered 15 to 30 minutes before a procedure begins. The medication most commonly comes in a tasteless or orange-flavored liquid syrup that can be mixed with juice or water. A person may experience negative side effects when taking chloral hydrate, especially in the first few days of starting a new prescription. Stomach cramps, diarrhea, nausea, and vomiting are fairly common and usually temporary. The recommended dose is low enough that most people do not experience dangerous side effects such as a very slow heart rate, extreme fatigue, and confusion, though such complications are possible. An overdose can cause bloody vomiting, a fluttering heartbeat, shallow breathing, and fainting. A person who has a severe reaction to chloral hydrate should be brought to an emergency room right away for detoxification. As with many other CNS depressants, chloral hydrate can become addictive. A person may build a physical tolerance to the drug, meaning that he or she needs to take larger and larger doses to achieve the desired effects. Physical and psychological dependence are major concerns, and an individual might feel unable to function properly if the drug is not available. Most people are able to use the medication responsibly for the length of a two-week prescription, but any symptoms of addiction that do arise should be assessed by a doctor right away so medications can be adjusted, and the patient can get the proper help. What are Different Types of Sleeping Pills? Do I Need Sedation for an MRI?